Autoinflammatory bone diseases are disorders characterized by chronic osteitis, bone resorption, and abnormal remodeling resulting from aberrant unprovoked activation of the innate immune system. The areas affected by chronic bone inflammation are typically culture-negative, with no apparent pathogen on histopathology. Inflammatory skin lesions are often present, as well as accompanying fever. Chronic recurrent multifocal osteomyelitis (CRMO), SAPHO syndrome, Majeed syndrome, pyoderma gangrenosum and acne (PAPA), deficiency of interleukin-1 receptor antagonist (DIRA), CINCA/NOMID, and cherubism are among the most common autoinflammatory bone disorders in childhood, and CRMO is by far the most studied and well-recognized of them all. This chapter covers the imaging findings of some of these diseases, focusing on CRMO as the prototypical condition of the group. Hedrich CM, Hofmann SR, Pablik J, Morbach H, Girschick HJ. Autoinflammatory bone disorders with special focus on chronic recurrent multifocal osteomyelitis (CRMO). Pediatr Rheumatol Online J. 2013; https://doi.org/10.1186/1546-0096-11-47. Leclair N, Thörmer G, Sorge I, Ritter L, Schuster V, Hirsch FW. 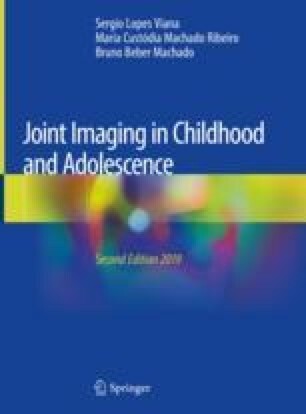 Whole-body diffusion-weighted imaging in chronic recurrent multifocal osteomyelitis in children. PLoS One. 2016; https://doi.org/10.1371/journal.pone.0147523. Mallick A, Chaturvedi A, Muthukumar N. Chronic recurrent multifocal osteomyelitis: a diagnostic dilemma: a case report and review of the literature. JBJS Case Connect. 2016; https://doi.org/10.2106/JBJS.CC.15.00119. Roderick MR, Shah R, Rogers V, Finn A, Ramanan AV. Chronic recurrent multifocal osteomyelitis (CRMO) – advancing the diagnosis. Pediatr Rheumatol Online J. 2016; https://doi.org/10.1186/s12969-016-0109-1.